Increasingly, designers need to present information in ways that aid their audience's thinking process. Fortunately, results from the relatively new science of human visual perception provide valuable guidance. 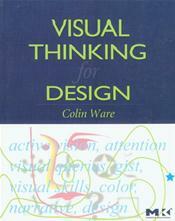 In Visual Thinking for Design, Colin Ware takes what we now know about perception, cognition, and attention and transforms it into concrete advice that designers can directly apply. He demonstrates how designs can be considered as tools for cognition - extensions of the viewer's brain in much the same way that a hammer is an extension of the user's hand. Experienced professional designers and students alike will learn how to maximize the power of the information tools they design for the people who use them.